Maison Veuve Clicquot Ponsardin counts itself among the most exclusive international brands – able to be recognized by color alone. Clicquot’s yellow acts as its veritable signature, an audacious symbol of innovation to wrap its beloved bottles. And the remarkable story of how this color came to dress the brand is one worthy of being retold. In the beginning, Madame Clicquot was skeptical about putting a label on her bottles, repeatedly denouncing the practice as “a quackery.” After all, a label could contain information that could be true or not. She asserted that only a wine’s quality should account for its brand recognition, not the pompous references that might be written onto its labels. However, she was eager to conquer the American market, one that had a tendency to value what would eventually become known as “packaging.” And so, Madame Clicquot was finally convinced to dress her bottles with a label, but she insisted it be as “simple as it was elegant and luxurious, without excessive decoration.” Her “indispensable and utmost condition” was that the label could not state “anything that wasn’t entirely true.” This honorable request was honored with the first label of the Maison, stating simply “Veuve Clicquot Ponsardin” on its front. This concise labelling was a revolutionary approach for the era, as other champagne brands were covered in words and décor. The United Kingdom was the first market of the Maison, and from 1876 onwards there grew a demand for a less sweet champagne; the British liked to drink Champagne wine with their meals. Veuve Clicquot delivered, but it became necessary to differentiate this “dry” champagne from the original, which had had a white label. 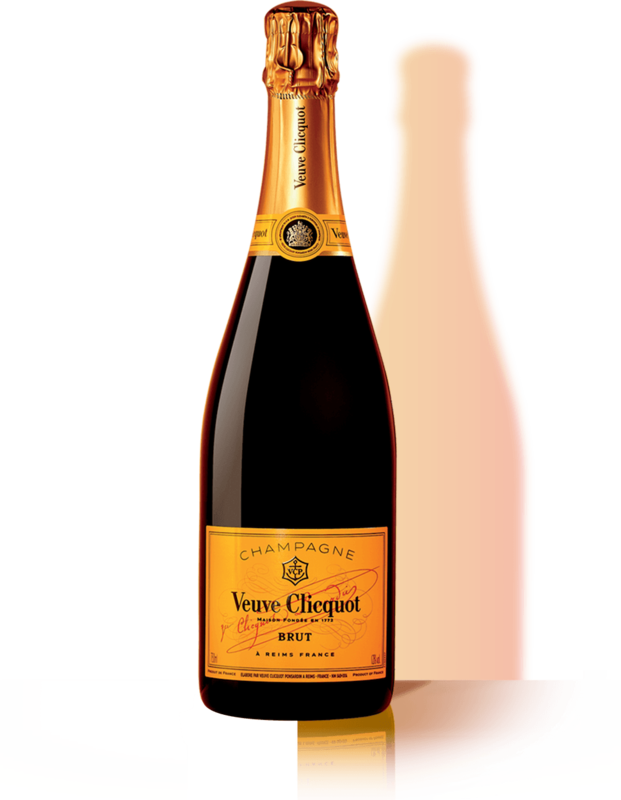 Thus the famous yellow-colored label of Veuve Clicquot was first launched in 1877, delineating a drier champagne, and forming the foundations of what would become today’s famed Yellow Label. Evolving the new label from the original white design, yellow was chosen because it was slightly darker than the white, and a color less likely to fade with time – as bottles were often aged before being enjoyed. At this time in the UK, one would typically age a bottle of champagne for two years before opening it.